Undoubtedly, diamonds are a girl’ best friends. Not just a ring, but any piece of jewelry that has diamond integrated into it would be a priced possession for her. However, buying a diamond ring might seem to be a complicated process. But, hold on. If you are ready to purchase a diamond ring for your loved one, here are some of the things you must know. Presenting a diamond ring to your partner signifies a prominent milestone in any relationship. Thus, needless to say, anyone would want the purchase to be precisely accurate. While you may easily accumulate help from the experts, it is important to do a bit of homework on your own. Therefore, before going through a humongous collection of Diamond Rings for Women out there, here are some of the things that you must know. Scroll down and stick to this post as it is surely going to be helpful. Diamonds are classified by four Cs: Color, Cut, Carat, and Clarity. Color: The color is graded from D (colorless) to Z (yellow). Although a majority of people select colorless, it is tough to distinguish with naked eyes. A preferable range is G to J. Cut: Although every C affects the price of the diamond, still the experts suggest that Cut is the most important out of all. Since the cut is the aspect that brings out the shine out of the diamond when it comes to light, investing in an excellent cut would be the best decision. Carat: Carat is the standard unit of weight measurement of the ring. Thus, size does matter, but bigger is not always the best one. So while selecting, you must consider how it will look at her hand. Clarity: The clarity can be gauged with the imperfections you can point out in the diamond. It is graded from flawless (FL) to inclusions (I). Most of the times, people prefer going for flawless, but having a few inclusions added may increase the value. There are ten standard shapes in which a diamond is cut, round being the most common one. Almost 75% of the people like to purchase round diamond rings. 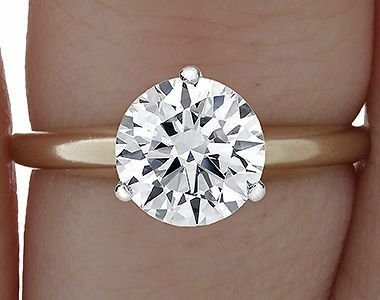 So, just because of their popularity, round diamonds cost more than any other shapes. Thus, if you cannot afford an expensive ring, you can choose another shape than round. While it may be almost impossible to answer that question, you can surely know what women want when it comes to diamond rings. Firstly, always try to go for solitaire diamond; almost nothing can beat that. Secondly, don’t go on the size of the ring but more on the clarity and quality of reflection it offers. A small but shiny diamond is better than a big but dull diamond. As for the ring band, try to choose one that is sleek and not so shiny; dull gold may be a good option. After all, it is the diamond that should stand out. Select a jeweler as carefully as you would choose a doctor. You must conduct a proper research and should find out a jeweler who is a credential. You can even read reviews online and then select as per the results. So, these are some of the things that you must keep in mind while searching for Diamond Rings for Women. Leave no stone unturned; remember diamonds are a women’s best fried!